A better-than-average, gravity-defying ninja duel leads to an epic chase– by leaps, swings and ziplines — through the Himalayas in the big set piece sequence of “G.I. Joe: Retaliation.” Masked villains in red ninja suits chase Snake Eyes and Jinx as they attempt to spirit a ninja villain out of a mountaintop lair. They scamper, by rope, across impossible slopes, swinging their swords. And when a line is cut, the victim yowls into the void. It may be the most dazzling bit of business of its kind from the age of digital stunts. The rest of the movie? Seriously, it’s a live-action version of on an ’80s cartoon that was designed to sell toys. This is “Transformers” without the Bumblebee Camaro, a lot of action, a few one-liners, and a lot of gunplay. And it was entrusted to the director of the Justin Bieber concert documentary. How good can it be? It’s got the biggest body count since…”Olympus has Fallen” — stabbings, shootings, blowings to bits. And barely a drop of blood. But it has Dwayne Johnson, an action hero who knows his way around a raised eyebrow, and a catch-phrase. His character, the G.I. Joe-force sergeant known as “Roadblock,” quotes Jay-Z for motivational speeches. He’s a father of two who tells his boss (Channing Tatum) that their little “extraction” from Pakistan (a country described as “A riot with a zip code.”) is so easy that they’ll be “Home in time for ‘Top Chef. '” Only they aren’t. COBRA may have been down for the count in the first “Joe” movie, but they have an impostor (Jonathan Pryce, playing the real prez and the fake one) in the White House and all manner of evil henchmen and ingenious gadgets (firefly-shaped bomb drones) to wipe out the G.I. Joes. And that’s not even mentioning the ninjas. It’s up to team members Roadblock, Lady Jaye (Adrianne Palicki) and Flint (D.J. Cotrona) — with maybe an assist from masked marvel Snake Eyes (Ray Parker) and the fetching fury Jinx (Elodie Yung) to foil evil — the masked COBRA commander and his sidekick, Firefly (RAy Stevenson). Maybe the Joes can enlist Bruce Willis, who needs to be reminded that John Wayne never played fifth banana in other people’s action pictures, even in his dotage. Acting? We’ll have none of that. Just D. Johnson manfully wielding an Arnold-sized heavy machine gun, masked stunt artists dodging pointy slo-mo 3D ninja stars and Jonathan Pryce, hamming it up as both a serious, imprisoned president and a snarky super villain disguised as that president. Things go boom and bodies go down and the one hour and fifty minutes zip by like oh, two hours and ten. There’s a “nuclear weapons are good for us” message that seems positively ’80s. But at least there are no jive talking, joking and pontificating robots. 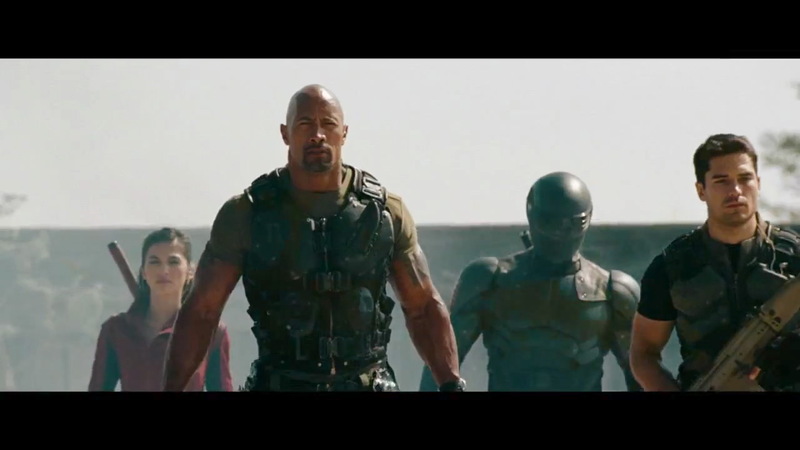 Cast: Dwayne Johnson, Channing Tatum, Bruce Willis, Adriene Palicki, RZA, Jonathan Pryce. Credits: Directed by Jon M. Chu, written by Rhett Reese and Paul Wernick. A Paramount release. Aside | This entry was posted in Reviews, previews, profiles and movie news. Bookmark the permalink. I can honestly say that with the extended time of 1hr 50mins this just may be a drastic improvement from that first nightmare I can’t speak for anyone else but I grew up with the Joes and I’m hoping this movie will improve the animated franchise into the live-action franchise. It has one dazzling sequence — in the Himalayas — which has nothing to do with the leads. 1:50. You apparently cannot tell time.